This basil spinach stuffed chicken breast is my modified version of chicken Kiev. 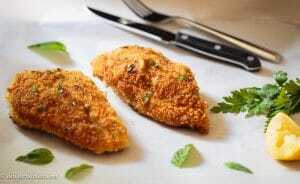 It features chicken breast stuffed with basil, spinach and walnut, breaded and fried until it is perfectly crispy. It is so moist, juicy and flavorful. 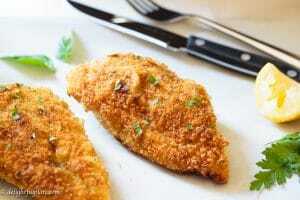 Classic Chicken Kiev is a dish of thinly pounded chicken breasts. A herb butter mixture is put in the center of the chicken piece. The thin chicken piece is then rolled tightly into a log, breaded and fried. 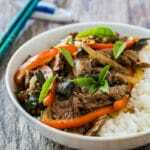 I learned about this dish through my housemate when I studied in London. She is a fan of chicken Kiev, in fact, she loves everything breaded and fried (well, who doesn’t?). We took turns to cook, and she made chicken Kiev every month. One of the things I miss the most about my time studying in London was the fun I had in the kitchen with my two housemates. Together we tried to cook so many Vietnamese dishes, such as Vietnamese chicken vermicelli noodle soup “bun thang”, oxtail pho noodle soup and fried spring rolls. The housemate who loved chicken Kiev was the most adventurous among the three of us. She often tried out Western dishes, including chicken Kiev and beef Wellington, and she was really into baking. Despite being completely self-taught, she makes the most beautiful wedding cakes I’ve ever seen. She’s now working as a professional baker, and I’m really proud of her. 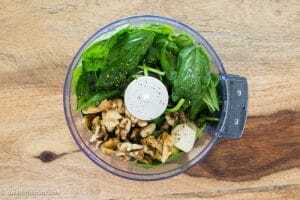 The stuffing consists of basil, spinach, walnut, garlic and olive oil. 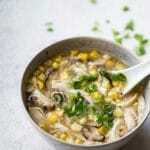 It makes the chicken breast moist, flavorful and succulent, just like using the herb butter mixture. I use olive oil since I don’t handle dairy well. If you don’t have any digestive problems with dairy, please feel free to use butter. 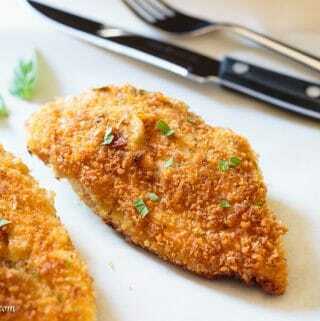 After you slice through the crispy exterior of the breaded chicken breast, you will be greeted with an amazing aroma. 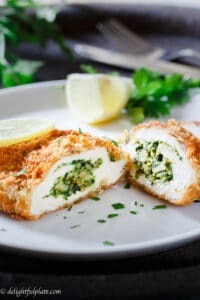 Though cooking can quickly destroy the flavors of basil, I find that when stuffed inside the chicken breast and with all the breading outside, the basil still retains its flavors in this recipe. I use a more simple method than the traditional method to prepare the chicken breast. Instead of pounding it thinly, I just make a pocket inside the breast and put the stuffing in there. I use Japanese panko to coat the chicken instead of standard breadcrumbs. 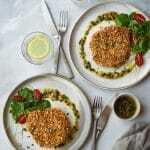 Japanese panko is a flaky type of breadcrumbs with light and airy texture. I find that using Japanese panko results in crispier and less oily fried food than using standard breadcumbs. If you can find it in your local Asian grocery stores, please give it a try. Otherwise, the standard type also works fine. This basil spinach stuffed chicken breast is crispy on the outside, and moist and juicy on the inside. An amazing aroma will greet you when you slice through the crispy exterior. 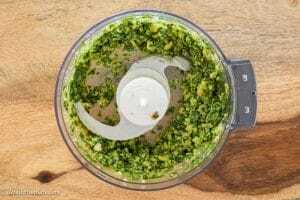 Put basil, spinach, walnut, garlic, olive oil, 1/8 teaspoon of salt and pepper into a food chopper. Process into a coarse mixture. Place all-purpose flour, egg and breadcrumbs into individual shallow bowls/plates. Beat the egg. Place chicken breasts on a cutting board and place a piece of plastic wrap over them, slightly pound to even thickness. Using a sharp utility or paring knife, make a deep pocket inside the chicken breasts. Don't cut all the way through. Divide the stuffing into two equal parts and put each part into each breast. Gently press to slightly flatten. Season the outside of the chicken breast with salt and pepper. Dust the chicken breasts with all-purpose flour. Dip into the egg, and then coat with breadcrumbs. Heat at least 1/2 inch of oil in a frying pan. When the oil reaches 350F, place the chicken breasts into the pan. Fry at moderate heat from 4 to 5 minutes each side, or until the internal temperature reaches 165F. Transfer to a plate lined with paper towel or cooling rack to absorb/drain excess oil. 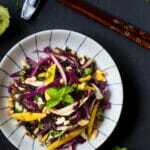 Move to serving plate, squeeze some lemon juice over it and enjoy.